Pit crews, qualifying races, and big trophies for the winners; no, it’s not stock car racing, it’s FASTAR® – an exciting academic competition for students at South Brunswick Charter School. Each year, nearly 200 charter school student-racers and their crew chiefs – parents – accept the challenge of tuning their reading and math skills, qualifying for the big race event, and competing for trophies and gold medals while their classmates cheer them on to the finish line! View WECT’s coverage of our 2015 event HERE ! Read Port City Daily’s coverage of our 2015 event HERE ! What does FASTAR® stand for? 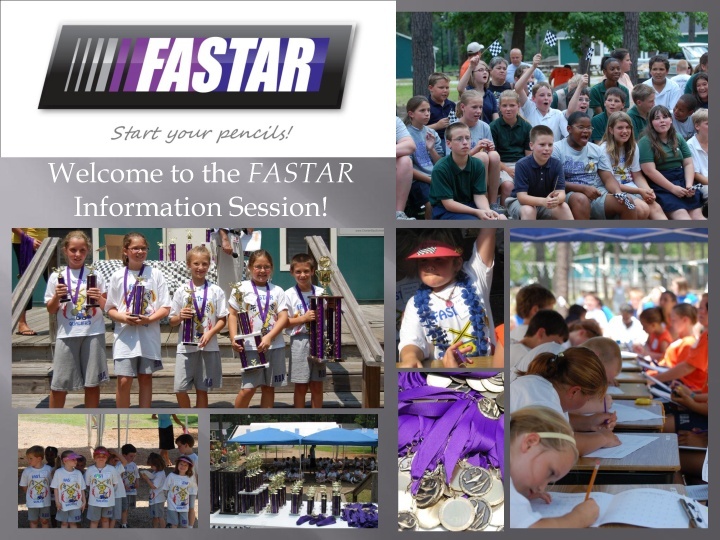 FASTAR® is a voluntary, extra-curricular academic tournament where students compete using academic skills such as in reading and math instead of physical skills such as in football or basketball. FASTAR® has been developed by The Roger Bacon Academy and is funded by RBA, the students, and sponsors. What is the goal of FASTAR®? The goal of FASTAR® is to encourage students to improve their basic skills through practice in an exciting and rewarding tournament modeled on automobile racing. Research shows that practicing to the point of fast, smooth, nearly automatic response – fluency – has several benefits: memory of the skill is retained longer, the student is able to perform the skill for a longer time before getting tired, comprehension may be improved, complex tasks are easier with a stronger foundation in basic skills, and homework times may decrease. What is an example of a benefit of FASTAR®? If a student reads very slowly and has to decode a sentence one word at a time, the meaning of the sentence will probably be lost. The student is focusing much of his effort on saying the words and is unable to comprehend the ideas contained in the text. After practicing reading to the point where decoding words is nearly automatic, the student can focus on the meanings. Why doesn’t each grade level have its own race? Most competitive sports are grouped into 3-year or 2-year categories. In swimming for example, children are grouped every two years, and they understand that they have to work harder when they move up to the next age level because they will be competing with kids that are a year older. Why is FASTAR® modeled on automobile racing? Automobile racing is the number one spectator sport in the United States. Kids of all ages get caught up in the excitement of these racers going fast – and going fast academically is the objective. Are the “tune-up” sessions mandatory? No, the tune-up sessions are optional but highly recommended. They are held to help racers and crew chiefs improve their performance and prepare for the big race day. How much time is needed at home to practice? There is no set amount of time. We suggest short (5-10 minutes each) sessions three days a week. When racers see their improvements on the progress charts, they may want to practice more. Speed: In auto racing, speed means how many miles per hour the racer can go. In FASTAR®, speed means how many items per minute the racer can accomplish – words per minute in reading, problems per minute in math, letters per minute in printing. Sponsor: In auto racing, the sponsor puts up money to support the driver and the race team. In FASTAR®, the sponsor helps fund the competitors. Sponsors may be local merchants, parents, neighbors, or anyone who wants to financially assist a racer in competing. Racers may look for sponsors to help them, and sponsors can look for racers. Racers can wear a patch with their sponsor’s name on their clothes on race and practice days. The entry fee is $20. Racers who practice and can demonstrate the speeds for qualifying get a $20 uniform coupon. Pit Crew: In auto racing, the pit crew helps the racer change tires, put gas in the car, clean the windshield, and do whatever it takes to help the racer compete. The pit crew for a FASTAR® competitor can help time with a stopwatch, provide snacks, sharpen pencils, and cheer. Anyone can be in the racer’s pit crew. Crew Chief: The crew chief is the boss of the pit crew and decides when the racer has run enough laps and needs to come in for more fuel. The crew chief will work with the racer on timing trials to get everything tuned up in practice for qualifying and for the actual race. In FASTAR®, the crew chief can be a parent, friend, older sibling, or classmate. Timing Trials: A timing trial is conducted by the crew chief and has the racer go as fast as possible for one minute – reading words, doing math facts, printing letters, for example. The number of correct items done in that one minute is the racer’s speed for that time trial. The crew chief must make sure that there are more items on the track than the racer can possibly finish. In a race, incorrect items are added to the times so treat them as learning opportunities to be eliminated. Speed with accuracy is the key. Mechanics: If the racer and the crew chief are having trouble in practice reaching their qualifying speeds, they can ask a mechanic to check over everything and make suggestions on how to improve the performance. Teachers, teacher assistants, and some older students make good mechanics. Garage: This is where the crew chief and racer get together to plan their strategies for performance improvement – often with the help of a mechanic. Qualifying: Each event has minimum speeds that must be demonstrated by every racer before the racer is allowed to compete in the actual race. These speeds are determined in qualifying timing trials scheduled with and conducted by race officials (teachers or assistants). The Course: The race course consists of a number of straight-aways connected to each other by turns. Straight-away: A part of the course where maximum speed should be used. A straight-away may be a page with a 200 word reading passage or a 50 problem set of math facts. Turns: The racer must turn the page when they finish one straight-away and go into the next straight-away. A Race: Each different race has a course layout that consists of several straight-aways. For example, a race for 4th graders might consist of a 250 word reading passage that leads into a 32 problem set of addition facts followed by a 32 problem set of subtraction facts and ending with a straight-away of a 32 problem set of multiplication facts. The racers all begin together when the green flag drops and must cover all items in order. The first racer to finish all items in the entire course wins. Every racer is timed, and judges keep track of errors. Each race course is individually designed with grade appropriate material. Row: During a race when racers are running one behind another they are said to be in “rows.” Usually the racers with similar qualifying times will race in the same row. Hitting the wall: Refers to a driver error when the racer loses control from going too fast and bumps into the outside wall. Bumping the wall will slow you down. Racers who go so fast they often bump the wall rarely win. In FASTAR® going TOO fast may lead to errors (hitting the wall).